Is part of your content not showing? Did you switch templates while designing your campaign? Did you click Paste in Code when you switched templates? Did you lose connection to the server or have too many tabs open? Campaign content can disappear for a few reasons, and can be recovered in most cases. In this article, you'll learn what can cause content to disappear, and how to fix it. If you copied your content from Microsoft Word or a website, the underlying code may have included a notation that prevents the content from displaying altogether. In the Campaign Builder, click to edit the area where the content should be, click the < > Source icon in the toolbar, and check for content that is missing that you expect to be there. If all your content shows in the source, then code or formatting is preventing the content from displaying as intended. Clean up your content to strip out this extra code, so your campaign displays like you want. When you switch templates in the Campaign Builder, Mailchimp attempts to automatically move all previous text content into your new layout. Sometimes the layout for the new template is too different to make a direct content transfer. When this happens, your content is not lost. Any content we're unable to automatically place in your new layout can be accessed in the Campaign Builder. To see recovered campaign content, follow these steps. Navigate to the Campaign Builder, and click a text block to edit it. In the edit pane, click the Recovered Content button. Click the left and right arrows to view each piece of recovered content. When you find the content you want to use, click the Use This button. If you find yourself on the Paste In Code screen, navigate back to the Template section of the Campaign Builder. Choose from the various available template categories and select one for your campaign. Mailchimp is a web-based application, so if the internet connection slows or breaks, it can cause unexpected behavior in the application. Our auto-save feature works as long as a connection continuously runs. If the browser is idle, it may appear that you are still connected even though the browser has timed out. We take every measure possible to ensure data automatically saves, but a browser timeout can prevent us from auto-saving as expected. If many tabs are simultaneously open in a browser, it can result in invalid cookies or more frequent browser timeouts, both of which can prevent content from saving. We recommend that you limit the number of additional tabs open while working in Mailchimp to ensure the connection remains active. Learn how to avoid common formatting issues with content created in a rich-text editor like Microsoft Word or Google Docs. 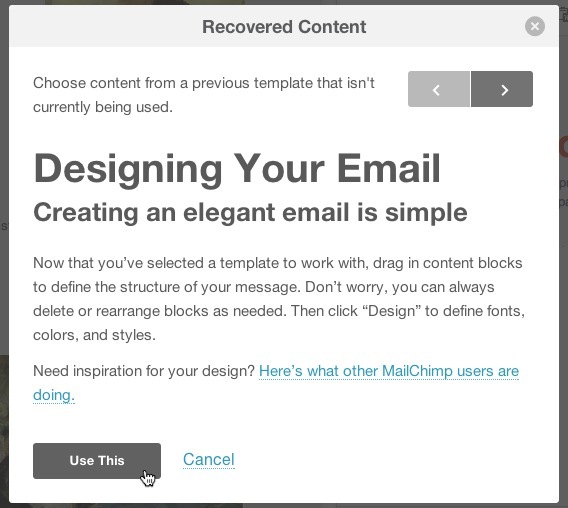 In Mailchimp, you can switch templates any time. It's an easy way to change your email marketing campaign's look. Learn how to make a switch and recover any missing content.